What does a pharaoh’s conquest have to do with Israel? The Merneptah stele, An Egyptian inscription in which reference is made to Israel in the words, ‘Y-s-rl, his seed is scattered’. The Merneptah Stele (or Israel Stele) is an engraved stone slab which describes Pharaoh Merneptah’s military victories in 1207 b.c.e. The stele itself is dated to the year 1205 b.c.e. Renowned British archaeologist Flinders Petrie discovered this two-meter-tall, inscribed granite monument in 1896 at Thebes. It contains the earliest undisputed extra-biblical reference to Israel to date. Israel is mentioned by name in three different 9th century b.c.e. artifacts: the Mesha Stele, Tel Dan Stele and the Kurkh Monoliths, but the 9th century is still 400 years after the dating of the Merneptah Stele. The mention of Israel in this 3,200-year-old document suggests, at the time of its inscription, the nation of Israel was an established power and not a nomadic people who had just recently entered the land of Canaan. Before the discovery of the stele, many dated the Exodus much later, but now they are forced to reconcile with the fact that Israel was already an established power in Canaan in 1207 b.c.e. Merneptah was the 13th son of Ramesses ii. Although his life was overshadowed by his father, many Egyptologists suggest that Merneptah was both a co-ruler and the real power behind the throne in the last few years of Ramesses’s life. His military campaigns are recorded on three separate ancient inscriptions, with the Victory Stele of Merneptah as one of them. Israel, then, must have been a people strong enough for Merneptah to mention them in boasting of his victory. If Israel was some small nomadic tribe just beginning to settle in Canaan, Merneptah wouldn’t have had anything to boast about. Alternatively, if Israel had been established for 200 years, built its own structures and had a stronger military, then his victory would be worth mentioning. Note, the word used here for Israel is referring to the people, not the land. It also implies that Israel did not have a king, which would mean they were still in the time of the judges when Merneptah invaded! This suggests the Exodus occurred even earlier than the 13th century b.c.e., something that is confirmed in the Bible (see 1 Kings 6:1). 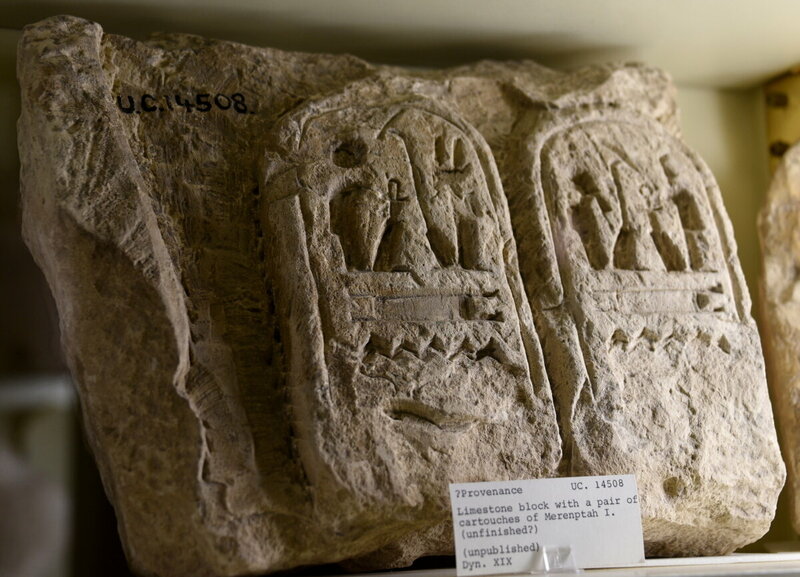 Limestone block showing a pair of unfinished cartouches of Pharaoh Merenptah (Merneptah). The sixth chapter of Deuteronomy says Israel would inherit “great and goodly cities, which you buildedst not, And houses full of all good things, which you filledst not” (verses 10-11). This means when Israel initially came into the land of Canaan, there was not a dramatic cultural change. There were no massive building projects; those came later, once buildings began to deteriorate or were destroyed and needed to be rebuilt. That reconstruction didn’t begin until around 1200 b.c.e., which leading archaeologists designate as the beginning of the Iron Age in Canaan because of the cultural change within the region. This too could possibly be linked to the necessary reconstruction after Pharaoh Merneptah’s campaign. The Israel Stele’s importance to archaeology cannot be overstated. Its contents disprove the later dating of the Exodus. If the Exodus had not occurred until the 13th century b.c.e., then at the time of Merneptah’s 1207 conquest, Israel would not have been an established power; therefore, mentioning Israel by name in victory would have been unnecessary. Importantly, this helps to prove the biblical assertion that Israel has been in the land of Israel for more than 3200 years.